In the summer time all the kids are playing in the park and you will get to play some Tennis in this awesome sport game. Choose your player and play in tournaments all around the world. Meet experienced players and start showing them how this sport is played. Throw the ball in the air and then select the hitting angle. You should try to keep the ball in the field and chase the ball when you see it coming towards you. Hit it again and remember that when charging up for a shot you can change the direction of the ball to surprise the opponent. 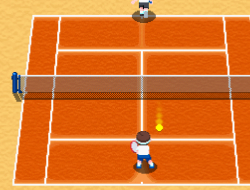 Use the arrow keys to move and Space to hit the tennis ball. Flash Tennis 10.00 between 0 and 10 based on 1 votes.